I'm assembling a 10 speed Chris King hub / Shimano cassette that includes a 10T cog. The idea is to get a high enough top gear on a small wheeled (406) bike. The donor cassette is an XT 10 speed, 11-34. I've machined a new cassette locknut from some thick walled 4130 tubing - this locknut has a 1.2" x 24TPI external thread and a small 32mm diameter collar. The cassette is assembled using teh bottom 9 cogs from the donor cassette. This includes 2 assemblies with 3 cogs each and the next 3 loose cogs. The tenth cog is the 11T cog from a Shimano Capreo cassette. I need to use this part instead of the original because that cog's internal diameter is too large for the collar on my locknut. Teh collar cannot be any larger of the chain will rub when running in the 10T gear. This 11T Capreo cog has the centre hole bored out to 30.6 so the new lockring thread can fit through. I've completed this work. The final cog is the 10T from the Capreo. I have to machine part of the back off and then TIG weld it to the new lock ring. This will hold all 11 cogs onto the hub shell. The final part of the puzzle is to braze the Capreo 9T cog to a large nut, then remove the teeth. Thiis will be the removal tool. You should probably make a few extras for future replacements, depending on your likely future mileage per year on the bike. are fine and 60 speeds(6 cogs on mid, 10 cogs on rear cassette) gives me ample choice. I am confused. It seems you are building an 11 speed cassette; 9 from the original XT cassette and then 11T and 10T cogs from a different cassette. If this is correct, I assume you are using an 11 speed shifter as a 10 speed wont shift an 10 speed cassette properly. Also, why not just change the chainrings (larger) to get the same effect. I am confused. It seems you are building an 11 speed cassette; 9 from the original XT cassette and then 11T and 10T cogs from a different cassette. If this is correct, I assume you are using an 11 speed shifter as a 10 speed wont shift an 10 speed cassette properly. .
You are not confused. This will indeed result in an 11 speed cassette. 11 speed controls are required to shift to the additional cog, and also a shiftmate will be required (ergopower levers to shimano cassette, 11speed to 10 speed spacing). WRT to larger chain rings, I am already planning on a 60/61T large chain ring. With 406x32 tyres this gives approx 117 gear inches. OK, Shimano Caprio hubs use an exclusive cassette 9t > 26 t .... 9-10-11-13-15-17-20-23-26 , yes "just" 9..
and so making a smaller chain ring effectively bigger.. a 2.5x overdriven 28t is effectively a 70t.. Easier to do when you have the methods fresh in mind. Agreed, I have some extra Capreo cogs. However I'm still just experimenting as this adaptation requires a fair bit of machining. The other method I'm looking at would require a bushing to replace the original locking. This would have an external and internal thread, allowing a smaller lockring to be made and used. 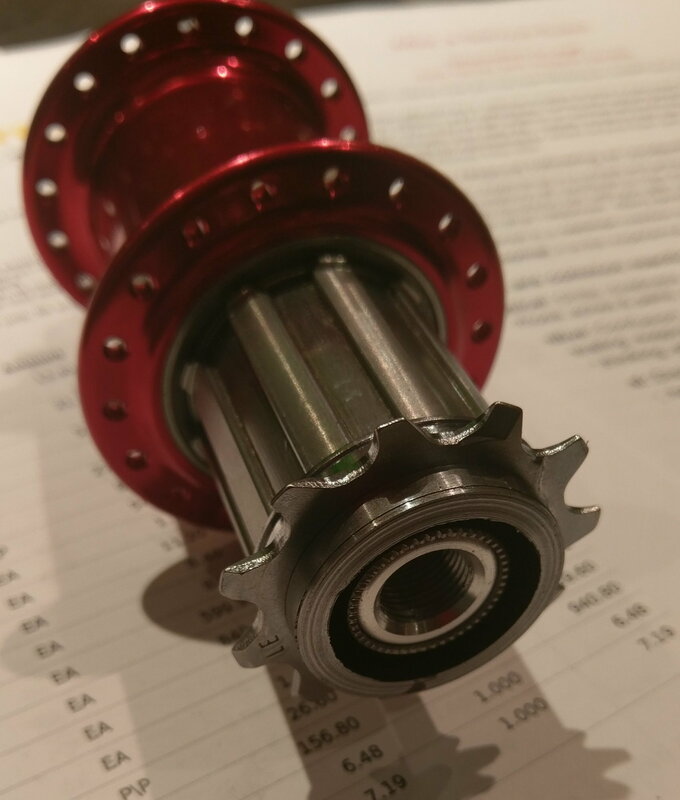 The tricky bit is ensuring the wall thicknesses of the bushing and the new lockring are sufficient for strength, as there is not a lot of clearance between the hub shell and the axle.This would also use the existing castellations between the 11T and 10T to carry the torque of the 10T, rather than the lockring thread. This also requires fewer changes to the 11T and 10T cogs from the Capreo, merely an enlarging of the centre hole to fit the smaller diameter of the lockring. A few more pix of the process showing before and after would be interesting to those of us who fiddle in this direction. I made a jig consisting of a 2 clamping plates with a bored holes - this locates and securely holds the 11T sprocket to allow for the inner hole to be enlarged. I have yet to make a fitting to hold the 10T in the lather so the thickness of the backing can be reduced. and so in hub 3rd your 12.t is 4/3 higher..
Last edited by fietsbob; 03-19-19 at 03:58 PM. I've been using a Capreo/11-speed hybrid for a couple of years now. my favorite cassette is 9/23, 11 speed. Frankly, the 10T sprocket gets quite a bit more use than the 9T, and, probably more in the 11/12. If you look at the Capreo sprockets, you'll see the indexing teeth, and a thin band. Remove the extra band and spacing between sprockets comes out pretty good. I haven't had any issues using the thicker 9s sprockets with 11s chain, although I think the worst shift point is the interface between the Capreo and 11s cassette (9,10,11 from Capreo, 12 from donor). More notes by PM if anybody is interested. Obviously if you want a wide range cassette, then go with the SRAM XD system. I think Shimano is also coming out with a wide range 12s cassette with a 10T. I'm looking to avoid avoiding additional weight and efficiency losses so have ruled out any form of internal gearing for this project. BTW I ride an Alfine 11 equipped bike for my everyday transport requirements. Sounds interesting. This is for a tandem project so the Capreo hub was ruled out as we are reasonably hard on our equipment.